Support | URO ELECTRONICS IND.CO.,LTD. Click the product name to download the User’s Guide (PDF). Q.How can I purchase products? A.We introduce our dealer to you. Please contact our sales department. Q. What kind of batteries are used with your products? How can I get these batteries? “URO Turbo Faucet” and “URO Clean Excel” use one lithium battery “6V CR-P2”. Please purchase batteries at electronics retail stores or local shops. * Four AA Alkaline batteries are used for URO Turbo Faucet Model 5500 and 5501. 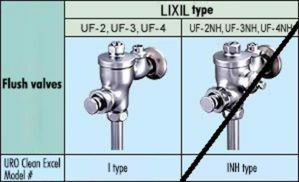 Q.What kind of flash valve can I attach to URO Clean Excel Model 5481? Q.How can I purchase the exclusive enzyme drug? Please contact our sales department when purchasing. Q.How can I purchase the AC Adapter for UROHAMIC? Before requesting the product repair, read the User’s Guide carefully. If you cannot resolve your product’s trouble, request us for service. When requesting service call, make sure to note the product name, part number, date of purchase, date of installation, and description of trouble. If the holding period of the repair part is terminated or parts are out of inventory, we may not repair the product. Your understanding of this matter is greatly appreciated. For product that was purchased from a dealer, please contact the dealer. For product that was purchased from us, please send the product to the address below.